Also known as rice and peas, this typical Caribbean accompaniment goes with many dishes and the creamy coconut base helps balance out the chillies in the ribs’ jerk marinade. Preheat the oven to180°C,gas mark 4. Mix together the oil, sugar, allspice, garlic, rum and jerk sauce, season and stir into the ribs. Cover and marinate for 1-2 hours. 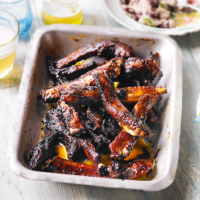 Transfer the ribs to a roasting tin and roast for 1 hour, stirring occasionally until tender. Remove the ribs, add a splash of water to the pan and bring the liquor to the boil, scraping up all the bits in the pan. Pour over the ribs. Meanwhile, bring the coconut milk and stock to the boil in a large saucepan. Drain and rinse the kidney beans and add to the saucepan with the rice and thyme leaves. Cook for 12-14 minutes, stirring occasionally, until the rice is tender and the liquid has been absorbed. Season and serve with the ribs.